By building systematically 6 instruments (in our case 5 instruments plus one more instrument as a unit control) we want to relate the intrinsic characteristics of the materials (density and stiffness of the wood) and geometric characteristics of the violin’s constituent parts (thicknesses of the plates and mechanic properties) with the tonal qualities of the complete violin. 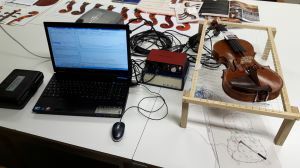 It is also intended to improve and develop the curriculum of BELE, the Violin Making School of Bilbao adapting the knowledge acquired in the investigation project. Modal Analysis will be performed at different stages: plates without thicknessing, on different graduation steps, during the tuning of the bass bar, plates under free and pinned boundary conditions, closed box with and without soundpost and neck, and finally the complete instruments. Once the instruments are finished Listening Test had been carried in order to correlate the mechanical characteristics and the tonal quality. These were divided on Free Categorization Tests, where isntrument players clasified the instruments and Psychoacoustic Tests, where and audience did so. We have arrived up to this point and soon will start publishing the results. For the moment you can find some information about the measurements.